NETWORK UPDATE: ONCE UPON A TIME and SECRETS AND LIES each gained 0.1 in final numbers, as did A.D. THE BIBLE CONTINUES, but AMERICAN ODYSSEY lost 0.1, putting it at a truly woeful 0.5. GAME OF THRONES wasn’t quite as titanic for HBO as it had been for its season premiere, falling 0.62, but at 3.57 it still topped everything on cable, and tied CBS for honors on television in general. SILICON VALLEY was similarly down, by 0.29 to 0.97, VEEP had a gentler fall, by 0.06 to 0.49, and LAST WEEK TONIGHT impressively was the only show in the HBO line-up to go up from last week, rising 0.04 to 0.71. On Showtime, NURSE JACKIE rebounded from last week’s season premiere, up 0.09 to 0.25, with 810K total viewers. 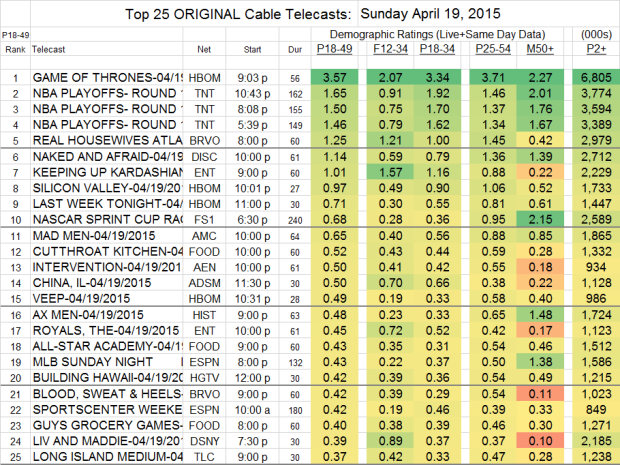 MAD MEN (AMC) eased off by 0.08 to 0.65. SALEM (WGN America) had a good night in percentage terms if not actual numbers, up 0.06 to 0.17, with 495K total viewers. Bravo’s REAL HOUSEWIVES OF ATLANTA gained 0.13 to 1.25, with BLOOD SWEAT & HEELS down 0.01 to 0.42, and FASHION QUEENS remaining at 0.25. Discovery’s NAKED AND AFRAID returned at 1.14. On E!, KEEPING UP WITH THE KARDASHIANS rose 0.07 to 1.01, and THE ROYALS (E!) was steady, down a tick to 0.45. It was TNT’s turn to host NBA PLAYOFFS, and its tripleheader scored 1.65/1.50/1.46. History’s AX MEN stayed at 0.48. Lifetime’s THE LIZZIE BORDEN CHRONICLES fell by 0.08 to 0.22, with 723K total viewers. Other programs of note will be added later.